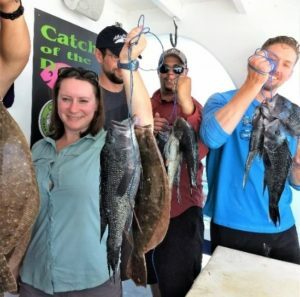 The 148th Annual Meeting of the American Fisheries Society (AFS) took place in Atlantic City, NJ this past August (19th – 23rd). It isn’t often a meeting with international reach visits your home turf and the Rutgers Student Subunit of AFS took this opportunity to get involved with meeting planning and execution. 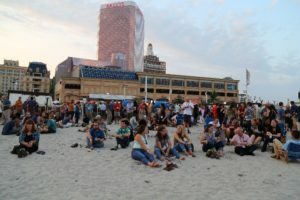 Over 1,800 participants attended the Annual Meeting in Atlantic City and roughly 490 were students, surpassing the previous record for most students attending an Annual Meeting. Subunit President, Jessica Valenti, led the charge for the student events at the meeting with the assistance of Subunit Vice President, Sarah Borsetti, and Associate Professor of Biology at Rider University, Paul Jivoff, while Subunit Advisor, Daphne Munroe, organized the phenomenal meeting program. 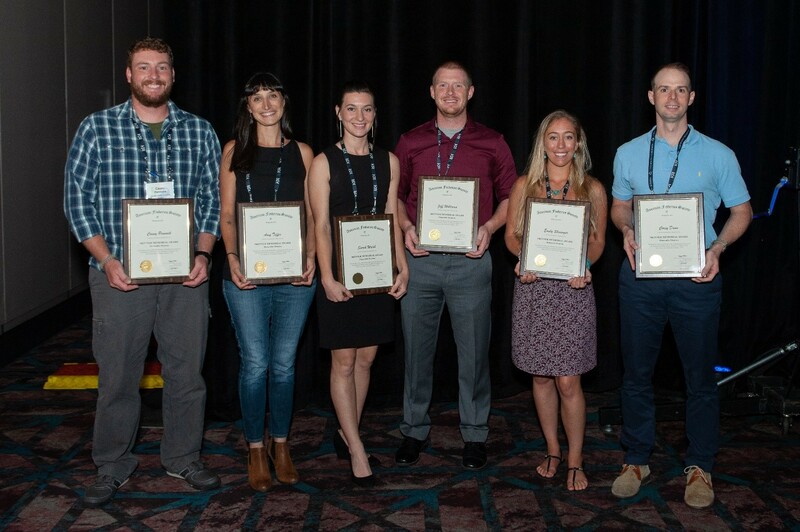 Jessica Valenti (second from left), Sarah Borsetti (first from right), and Daphne Munroe (second from right) receive certificates of appreciation from AFS President, Steve McMullin (5th from left), for their roles in the planning and execution of the 148th Annual Meeting of AFS. 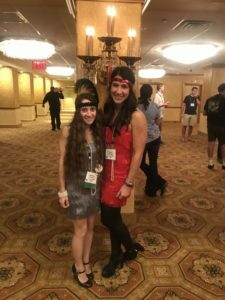 Jessica Valenti (left) and Sarah Borsetti (right) at the 1920’s themed Student Networking Event. Student events included the 1st AFS Student Quiz Bowl, the first ever “Student Challenge”, which encouraged students to network throughout the meeting, and the very popular 1920’s themed Student Networking Event complete with games of chance, themed décor and accessories, and ample opportunities to network with professionals and fellow students. 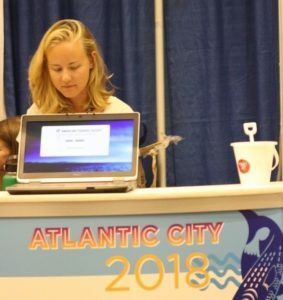 Subunit Treasurer, Laura Wiltsee, along with many other Subunit members volunteered their time to ensure the meeting ran smoothly by assisting at the registration and information booth and moderating sessions. 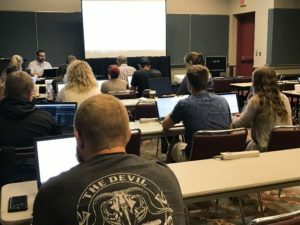 Additionally, Subunit member, Joe Caracappa, helped to lead a workshop which introduced fisheries scientists to the basics of the R programming language (Students of the AFS Mid-Atlantic Chapter: did you miss this workshop at AFS? Joe will be leading a half day R for Fisheries Students Workshop on December 9th, 2018 at Rutgers. Click here for more details) and Sarah Borsetti co-taught a crash course in ageing and age validation of finfish and shellfish. Both workshops were well attended and participants rated the overall quality of the workshops very highly. Left: Laura Wiltsee volunteering at the registration and information booth. Right: Joe Caracappa leading a workshop on the R programming language. Of course, one of the most important parts of these meetings is sharing your research with other fisheries professionals from across the U.S. (and even other countries) and Subunit members certainly didn’t fall flat in this category. Seven Subunit members gave at least one oral presentation at the meeting and many other Subunit members were listed as authors on talks and posters. Overall, there was a combined total of 21 oral presentations and posters that had Subunit members listed as authors! In addition to assisting with meeting planning and execution and presenting their research, Subunit members made sure to make the most of the other networking events and opportunities offered at the Annual Meeting. Members attended the Grand Networking Event at Bally’s Beach Patio, went on the AFS charter fishing trip, and took advantage of the opportunity to participate in the Spawning Run (5k) and Splash and Dash (400 m swim and 1 mile run) organized by Sarah Borsetti and Barnegat Bay Partnership Senior Program Scientist, Jim Vasslides. Top Left: Subunit members Nicole Deck, Andrea Sissick, and Laura Wiltsee enjoying the beach at the Grand Networking Event. 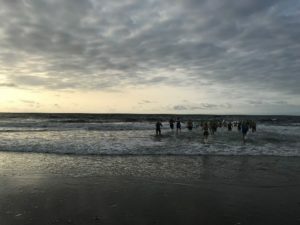 Top Right: Splash and Dash participants, including Nicole Deck, heading for the ocean to complete the swim portion of the race. Bottom Left: Subunit member, Abigail Golden, holding up her catch. 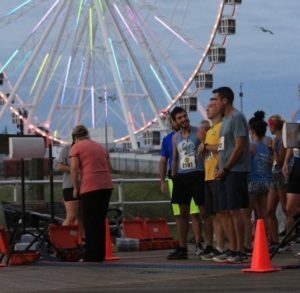 Bottom Right: Subunit member, Mike Acquafredda (#2191), waiting at the Spawning Run starting line for the race to begin. Subunit members were also the recipients of various travel and presentation awards. Emily Slesinger, Subunit Secretary, received an Honorable Mention for the John E. Skinner Memorial Award and Jessica Valenti was awarded “Best Student Presentation” by the Mid-Atlantic Chapter of AFS. Emily Slesinger (second from right) receiving her Honorable Mention for the John E. Skinner Memorial Award. 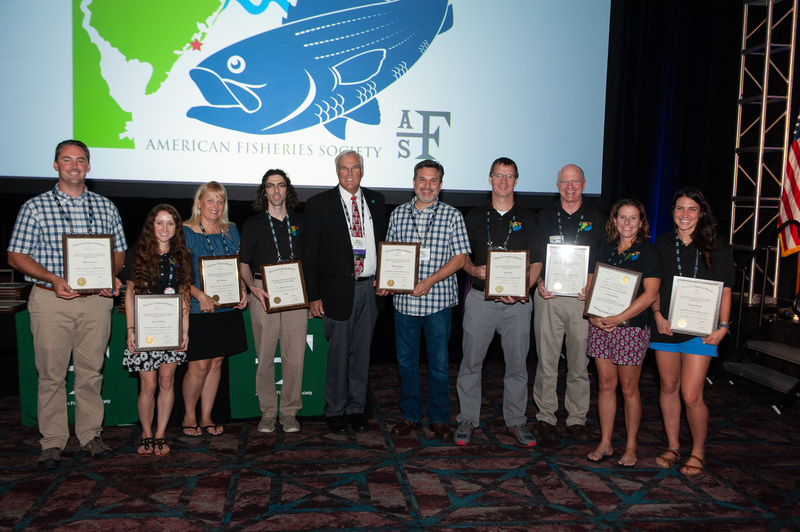 Overall, the 148th Annual Meeting of the American Fisheries Society was a fantastic experience for Subunit members who benefited from the numerous networking opportunities, including being able to get involved with meeting planning and execution. For many Subunit members, this was the first time they attended an AFS national meeting and given their positive meeting experience it will likely not be their last. We are looking forward to another strong showing of the Rutgers Student Subunit of AFS at the next Annual Meeting in Reno, NV September 29th – October 3rd 2019!